Four Marines were killed Thursday morning during shootings at two military facilities in Chattanooga, Tennessee. Three people were wounded, including a police officer and a Marine Corps recruiter. The shooter, identified as 24-year-old Mohammad Youssef Abdulazeez, is also dead. Abdulazeez was born in Kuwait, but grew up in the Chattanooga area and was a naturalized American citizen. The four Marines killed have been officially identified: Gunnery Sergeant Thomas Sullivan, Sergeant Carson Holmquist, Lance Corporal Skip Wells, and Staff Sergeant David Wyatt. 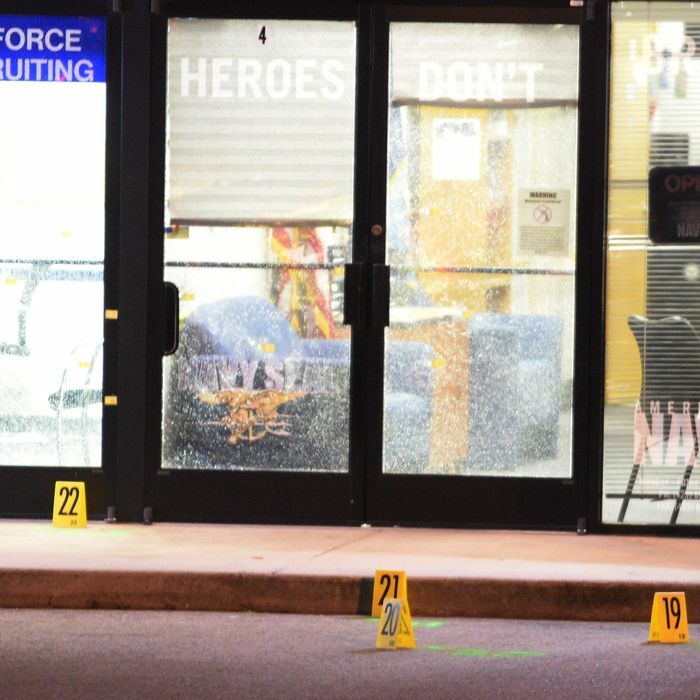 The attack began around 10:45 a.m. at a military recruiting center in a strip mall, where Abdulazeez fired 25 to 30 rounds from his car. In a press conference on Friday, the FBI said that the shooter had carried a handgun and at least two long guns. Only some of the purchases had been legal. Adulazeez wore a vest to carry ammunition. One Marine was wounded, and witnesses said they saw a man fleeing in a silver Ford Mustang. He then headed to a Navy Reserve center seven miles away and rammed his car through a security gate. Officials said Abdulazeez opened fire around 11:30 a.m., using multiple weapons and reloading. All of the fatalities occurred at the second site, and a police officer and a sailor were injured. An autopsy will be performed on Abdulazeez this weekend. According to the New York Times, counterterrorism officials said Abdulazeez hadn’t been on their radar, but his father was investigated years ago for giving money to an organization possibly linked to terrorism. The father was put on a terrorist watch list and questioned while traveling, but later he was removed from the list. The FBI is currently investigating recent trips Abdulazeez took to the Middle East. He visited Jordan for about seven months last year, and previously went to Kuwait and Jordan.